A Pakistani family crosses the River Swat by bridge at the hill station of Madyan. Italian archaeologists say they have discovered a cemetery that reveals complex funeral rites dating back more than 3,000 years in Pakistan's Swat valley, which was recently controlled by the Taliban. "The cemetery... seems to have been used between the end of the second millennium BCE and the first half of the first millennium BCE," he added. 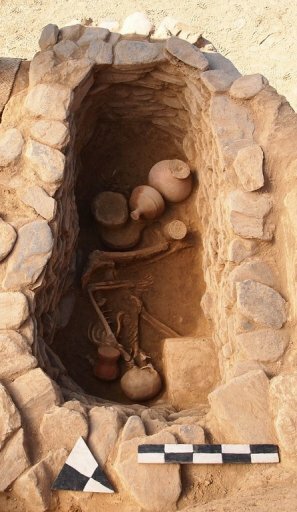 This handout picture released by the Italian archaeological mission shows a skeleton in an ancient grave discovered in Udegram, in northwestern Pakistan's Swat Valley. 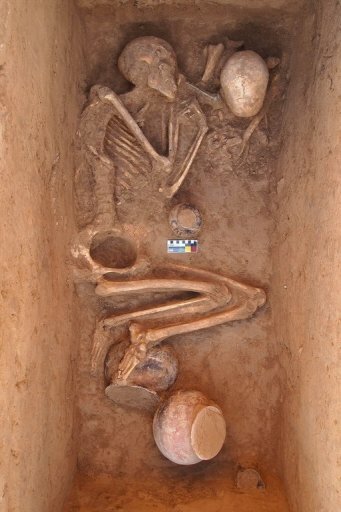 Archaeologists were aware of a pre-Buddhist grave site in Udegram, but only recently discovered the collection of almost 30 graves, tightly clustered and partially overlapping. Olivieri says the tombs point to the culture that predates the Buddhist Gandhara civilisation that took hold in northwest Pakistan and eastern Afghanistan from the first millennium BCE to the sixth century AD. This handout picture released by the Italian archaeological mission shows a skeleton in an ancient grave in Udegram, in northwestern Pakistan's Swat Valley. Swat was formerly known as the Switzerland of Pakistan for its stunning mountains, valleys and rivers. Bodies were first laid to rest in open graves, fenced in by wooden railings. Then the graves were re-opened and the bones partially burnt before the graves were sealed and a burial mound built. Men were buried with high quality flasks, bowls and cooking pots, and women with semi-precious beads, bronze hairpins, and spindles. Taliban insurgents led by cleric Maulana Fazlullah terrorised the Swat valley from 2007 to 2009, beheading opponents and burning down girls' schools as part of their determination to implement a harsh brand of Islamic law. An army offensive in 2009 claimed to have defeated the insurgency, but isolated attacks continue. In October, the Taliban shot schoolgirl Malala Yousafzai in the head in Mingora, the main town of Swat, in a case that sparked worldwide condemnation. She is now undergoing treatment in Birmingham, England.